Favourable demand trends helped Canada’s two main carriers record strong unit revenue performance year-over-year during 1Q2012. But the similarities end there as WestJet recorded a profit of CAD68.3 million (USD68.6 million) while Air Canada widened its loss from CAD19 million (USD19.1 million) to CAD210 million (USD210 million) year-over-year as its fuel expense grew by CAD147 million (USD147.7 million). Both carriers face challenges heading into the rest of year as WestJet has revised its cost guidance upwards and Air Canada continues to manage the fallout from its prolonged labour strife. WestJet’s 6% growth in passenger unit revenues beat the carrier’s own forecast as CEO Gregg Saretsky explained the revenue growth allowed WestJet to fully recover the 19.6% rise in fuel costs the airline recorded year-over-year. Total revenue at WestJet increased 15.3% during 1Q to CAD891 million (USD895.2 million) as yields increased 4.8% on a 8.8% rise in supply. Canadian airlines typically deploy a significant portion of their supply into US transborder and sun destinations during 1Q, and WestJet adhered to that strategy by deploying about 55% of its capacity (measured in available seat miles) during the first three months of 2011 into those markets. But the carrier also recorded a strong performance in its domestic markets, growing traffic 9.6% year-on-year on a 4.6% rise in capacity. Mr Saretsky remarked that WestJet’s fare mix continued to improve during 1Q2012, and that the carrier also recorded growth in corporate accounts, an area the airline has been targeting the last couple of years. The carrier will further expand its business markets in the second quarter when it launches new service from Calgary and Vancouver to Chicago and Toronto to New York LaGuardia, where WestJet will benefit from its codeshare with Delta Air Lines. Delta is building a hub in LaGuardia after a slot trade with US Airways that will result in Delta holding 56% of the airport’s slots during the summer timeframe. Currently the carrier is not seeing a slowdown in advance bookings, Mr Saretsky said. But he did note that with a 18-24 month ramp-up period, bookings in the Chicago and New York markets are below WestJet’s system average. However, he pointed to a “good trajectory” of booking volume in those markets. WestJet does expect the unit revenue growth it recorded during 1Q2012 to moderate throughout the rest of 2012, but believes it will continue to see strong revenue contributions from its expanding partnership base, its WestJet Vacations business and a push to grow ancillary revenues, which increased 10% to CAD8.39 per guest during the first quarter. Revenue performance was also strong for WestJet’s rival Air Canada during 1Q. The carrier recorded a CAD209 million (USD210 million) increase in its overall revenue to CAD3 billion (USD3 billion), and saw its unit revenues grow 5% year-over-year. Yields increased 3.3%, driven by a 4.8% rise in traffic that outpaced the 3.1% growth in capacity. Air Canada recorded yield and unit revenue improvement in all its regions during 1Q with the exception of the trans-Atlantic, which had a yield decline of 0.7%. But carrier CFO Michael Rousseau stressed that was an improvement over the 3.1% yield decline Air Canada recorded in its Atlantic markets during the fourth quarter of 2011. He remarked that all of Air Canada’s trans-Atlantic markets experienced revenue growth during 1Q2012 except for the UK, a market that had excess capacity and weak economic conditions. Domestic yields only grew 0.7% in 1Q, which was an improvement in the 0.4% growth recorded in 4Q2011. Air Canada cites overall strength in the domestic market place, with the exceptions of regional intra-Ontario routes and the Toronto-Montreal market, which were affected by increased competitive capacity. Premium revenues at Air Canada grew 11% or CAD54 million (USD54.2 million) during 1Q, driven by the introduction of a more attractive leisure fare on select North American routes, which triggered buy-up from lower-yield passengers and the introduction of electronic upsells. The carrier recorded a 13.5% increase in overall transborder revenues and a 3.9% increase in yields. Mr Rousseau cited a particularly strong performance in Air Canada’s routes to California, which showed double-digit unit revenue growth year-over-year. He also said the carrier’s routes to Hawaii and Florida performed well despite capacity increases in those markets. Those markets recorded a strong point of sale performance from Canada during 1Q, Mr Rousseau said. Similar to WestJet, Air Canada does believe strong traffic trends will continue, but is also cautioning of downward pressure on yields driven by industry capacity growth in the North American and European markets. Both carriers managed to practice prudent cost control during the quarter as WestJet’s unit costs excluding fuel increased a mere 0.4% year-over-year, well below inflation. Air Canada bested previous guidance of a 4%-5% rise in unit costs excluding fuel by recording a 1% increase. The better than expected performance was driven by deferred maintenance, likely spurred by the closure of Air Canada’s main repair and overhaul supplier Aveos, and lower selling and distribution costs. WestJet’s unit cost performance will weaken throughout the remainder of 2012 as the carrier revised its cost guidance for the full year excluding fuel upwards to an increase of 1.5% to 2.5% compared with previous guidance of flat to 1% growth. The carrier cited an improved revenue outlook, which will drive up sales and distribution costs and higher airport costs as the main drivers for the unit cost increase. WestJet’s management cited its increased presence at Toronto Pearson International Airport and new service to Chicago O’Hare International and LaGuardia, which are higher-costs airports. Mr Saretsky believes those service enhancements are bigger “pieces of a puzzle that we take a long-term view of”. Conversely, Air Canada has revised its 2012 unit cost guidance downwards, from 1% to 2% to 0.5% to 1.5%. Air Canada has issued a request for proposal to maintenance providers to reach long-term overhaul deals to replace the gap created by the closure of Aveos, and it is not certain if the results of those negotiations could affect unit costs guidance later in the year. 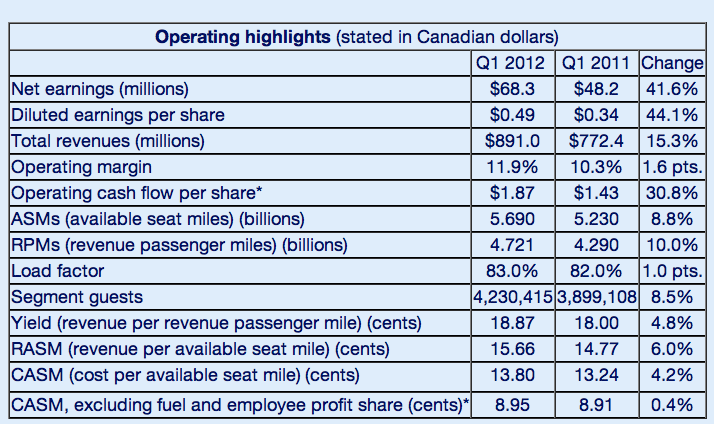 WestJet estimates 4% capacity growth in 2012, with domestic supply growing 0.5% to 1%. Estimated supply growth during 2012 is roughly half of the 8.5% WestJet recorded in 2011. The capacity growth is largely being fuelled by the new service to LaGuardia and Chicago. Air Canada is also growing capacity at a slower rate in 2012 as it projects supply growth of 1.4% compared with an expansion of 4.7% in 2011. The carrier did acknowledge booking weakness after the labour disruptions it suffered during the quarter as new contract negotiations grew increasingly contentious. The Government has stepped in to accelerate the conclusion of deals between management and pilots, mechanics and ground workers. Federal arbitrators have been appointed to handle 10-day negotiating periods for each work group. Air Canada CEO Calin Rovinescu emphasises that the airline aims to supply favourable wages and benefits to its employees, but needs better productivity as the carrier chips away at transitioning the carrier from its legacy airline structure to better compete in the current global airline industry. WestJet, meanwhile, says it has some anecdotal evidence that passengers have “walked the wing” to the carrier as a result of the work slowdowns at Air Canada during 1Q2012. Mr Saretsky points out WestJet’s on-time performance was more than 20 points better than Air Canada’s during the quarter. “If you’ve been disrupted several times it will really undermine the security you might have if you’re travelling to an important business meeting,” he said. But he cautioned it was really difficult to measure the appreciable increase in passengers. It will likely take Air Canada time to restore customer confidence even if it does conclude labour deals in the coming weeks. While that is occurring, WestJet could continue to see increased corporate demand as it continues its aggressive push into that market. Even though the carrier has warned of a cost creep, it does not appear that it will eat into WestJet’s continued profitability. Air Canada’s projected return to profitability remains uncertain as it continues to whittle away at its legacy cost structure while attempting to mend severely bruised management-labour relations.